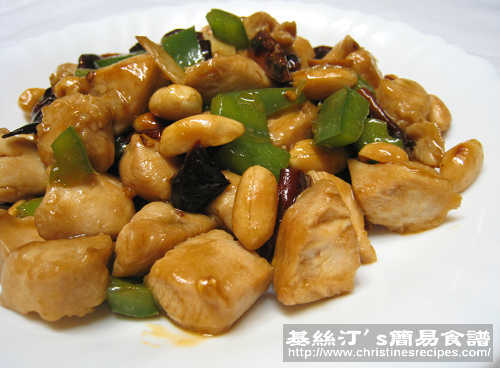 Kung Pao chicken (or Kung Po chicken, 宮保雞丁) is a very famous and popular Chinese dish, originating in Sichuan province, central-western China. 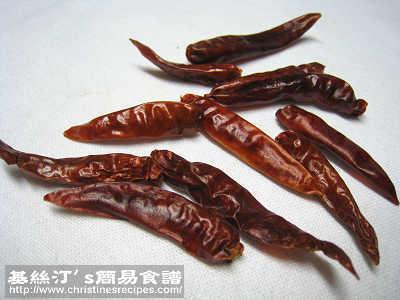 This dish is quite hot, yet you can adjust the amount of chilies and suit your preference to mild or little hot in home cooking anyway. 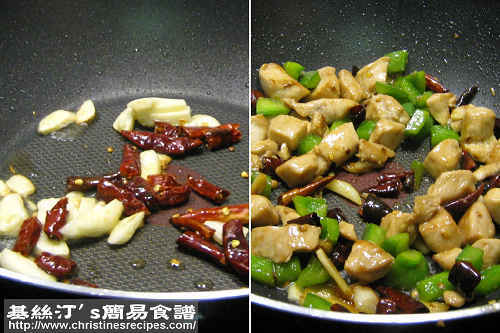 Many people are very curious about why this dish is called Kung Pao chicken instead of chili chicken or fried chicken. According to Wikipedia, the dish is named after a late Qing Dynasty official, Ding Baozhen (1820 -1886). He was born in Guizhou, served as head of Shandong province and later as governor of Sichuan province. His title was Gōng Bǎo (宮保), or palatial guardian. The name "Kung Pao" chicken is derived from this title. Nice stories about Ding were spreading around Chinese community. Ding was very found of foods and skillful in cooking. He also hired many famous cooks in his home to cook for his guests. There was a dish, fried diced chicken, often served on his guests’ tables. His guests loved this dish very much. So they named his fried diced chicken as Gong Bao Chicken. Marinade diced chicken for 30 minutes. Heat oil in a wok or frying-pan. Sauté garlic and dried chilies over medium heat until aromatic. Toss in marinated chicken and stir-fry until the outsides turn white. Sprinkle wine and stir quickly. Add capsicum and cook until softened. When the chicken is cooked through, add seasonings. Turn heat to high and cook until sauce dries up a bit. Sprinkle peanuts. Dish up and serve hot. I am also Ding, I wish I could have invented something like Kung Po Chicken, haha. Christine, this Kung Po Chicken u made is gorgeous! Thanks for sharing. yum yum.. I love kung pao chicken! really nice one you've got there. Who knows... You might be another inventor Ding. Now you're blogger Ding. This is looking good and gorgeous! Any printer friendly version of recipe for printing? Is Kung Poa Chicken the same as Szechuan Chicken?